Sit straight up in a chair with your shoulders relaxed. Keep your gaze straight ahead at eye level and your chin pointed down slightly. Slowly bend your head to the right side. Hold this stretch for 20 seconds. Rest for 15 seconds and repeat the exercise two more times. Then repeat the entire series on the left side. Sit straight up in a chair with your shoulders relaxed. Turn your head to look behind you over your right shoulder. Keeping your head turned to the right, slowly tilt your head to look up at the ceiling. Hold this position for 20 seconds. Rest 15 seconds and try it again twice more. Then try the stretch three times on the opposite side. 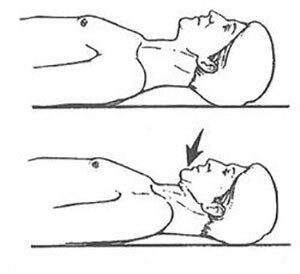 Lying flat on your back with both your knees bent to a comfortable position, tuck your chin down toward your chest and flatten the back of your neck down to the floor. Hold this position for 20 seconds. Relax for 15 seconds and try the exercise twice more. Purchase a 4 foot long, 1/2 inch diameter dowel rod (or use a broomstick) and grasp it at either end with both hands. 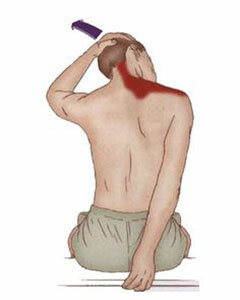 The rod should be at the base of your neck on your shoulders. Pull forward very gently on the rod with your hands as you push your head straight back so as to try to make a double chin. Do not let the level of your chin change. Watch yourself in a mirror to verify that your head is going straight backward. Hold this position for 5 seconds. Rest for 5 seconds and repeat nine more times. Standing in front of a mirror, slowly lift both shoulders up toward your ears. Try to lift them as high as they will go. Repeat this exercise 10 times. Stand in front of a mirror and watch yourself slowly roll your shoulders forward as far as they can go. From that forward position, then take the shoulders up toward your ears as far as they will go and then back as far as they will go so that you define half circles from front to rear. Do this 10 times. 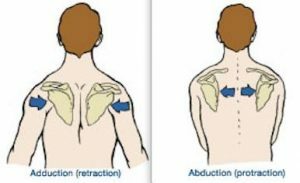 Repeat the shoulder rolls starting from the rear and going to the front. Stand up straight and slowly bring both shoulders forward as far as you can. Try to have the shoulders touch each other in front. Then take the shoulders back as far as you can, trying to squeeze the shoulder blades together in back of you. Repeat this 10 times. Stand up straight and slowly roll in a circle by taking your right ear to your right shoulder, dropping the chin to the chest, taking the left ear to the left shoulder and returning the head to center. Try to go as far as you can in each direction without pain. Do not let the shoulders creep up toward the ears. Keep them depressed throughout this exercise. Roll the head to the right 10 times and then to the left 10 times. Do not roll the head to the back. Stand up straight and take your left hand over your head. 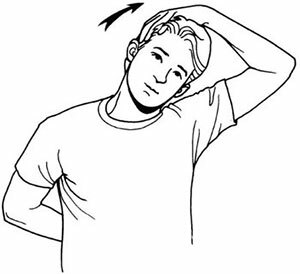 Bend it at the elbow so that your left hand is over your head near your right ear. Then take the right hand and push the left elbow with it more toward the right. Hold this stretch 20 seconds. Rest 15 seconds and repeat the stretch twice more on this side. Then repeat the exercise on the other side. Stand up straight in front of a mirror and make sure both shoulders are pointed straight ahead. 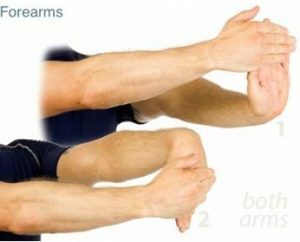 Take the left arm across your chest so that your left hand is near your right shoulder. Use your right hand to then push your left elbow in close to your chest and your left hand more toward the rear of the room. Hold this stretch 20 seconds. Rest 15 seconds and repeat the stretch twice on that side. Then repeat the whole exercise on the other side. 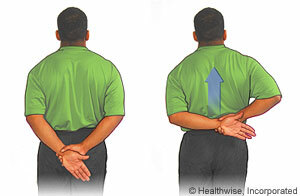 Stand up straight and place your left hand in the small of your back. Then grab the left hand with the right and pull the left hand more in the direction of the right. The shoulders should stay squared off to the front during this stretch. Hold the stretched position for 20 seconds, rest for 15 seconds and repeat it twice more. Then repeat the entire stretch on the right side. Sit or stand straight up and raise your left arm straight out in front of you. Flex your left wrist up so the fingers point toward the ceiling. Use your right hand to pull the left palm and fingers in toward your body more. Hold this stretch 20 seconds. Relax for 15 seconds and repeat this stretch twice more. Try it on the other side. Then again take the left hand out in front of you, but this time point the fingers down toward the floor. Again use the right hand to exacerbate the stretch of the left forearm. Again hold the stretch for 20 seconds, three times. Repeat on the right. Stand in front of a mirror. Place a 4 foot x 1/2 inch dowel rod (or broomstick) in your hands in front of your body. Raise the dowel rod up over your head and take it back as far as you can without bending your elbows. You should feel a stretch in the front of your chest. Hold the stretch 20 seconds. Relax for 15 seconds and try again two more times. Stand in front of a mirror. Place a 4 foot x 1/2 inch dowel rod (or broomstick) in your hands in back of your body. Keeping your elbows straight attempt to left the rod up as high as you can to the back of the room without lurching your body forward. Hold this stretch 20 seconds then repeat it twice more. After that, move the rod as far as you can to the right and to the left-again with your hands behind your back. 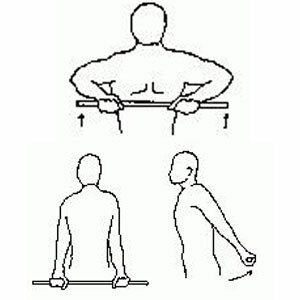 Finally, allow your elbows to bend and try lifting the rod up your back as far as you can. You should feel a stretch in the front of your shoulders with all of these movements. Lie on your stomach with your left arm off the edge of a table or lean over from a standing position so that your body weight is supported by your right hand and your left arm hangs freely from the left shoulder. 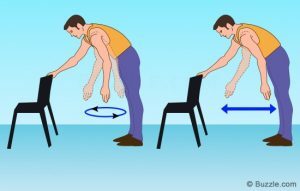 Very gently move your left arm in clockwise circular motions 10 times. Then perform counterclockwise motions with the same arm 10 times. Finish the series of pendulum exercises with cross motions- forward and backward and side to side movements. These exercises should be initiated with muscular force and allowed to continue by sheer momentum. 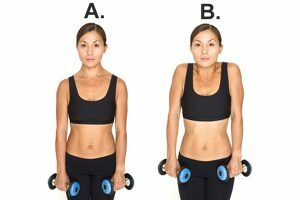 A very small dumbbell weight can be used in the hand to increase the shoulder traction. This exercise should NOT cause any discomfort. Stand in front of a mirror and grasp one end of a bath towel with your right hand. Throw the other end of the towel over your right shoulder so that the left hand can grasp the bottom of it behind your back. 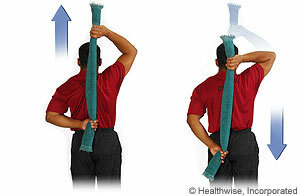 Use the left hand to pull down on the towel, thereby stretching the right arm up. Hold this stretch for 20 seconds. Relax for 15 seconds and try it twice more. 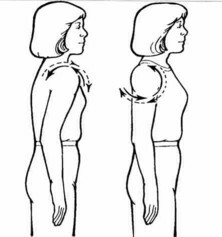 Then raise the right arm as high as you can so as to cause the left arm to bend up toward the shoulder blades. Hold this stretch for 20 seconds. Rest it for 1 5 seconds and repeat twice more. Then try the entire stretch sequence on the opposite side. So do not let pain continue to make your life miserable. 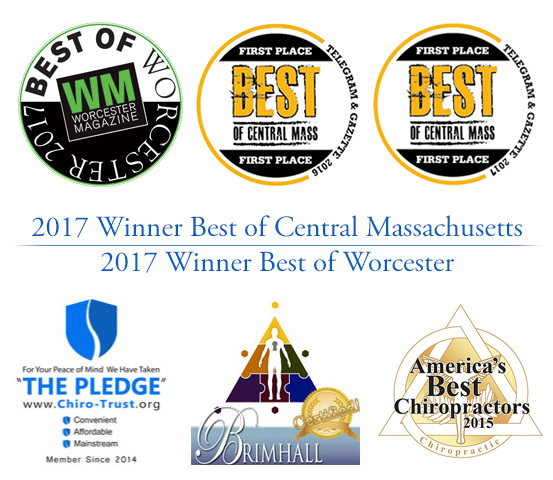 Contact Nault Chiropractic so you can get back to your old self and enjoy a life not dominated by pain.